Mission: To promote awareness and appreciation of El Sobrante Valley history through preservation and education, and chronicling of the community's heritage for current and future generations. Contact us at the above address if you would like a local historian to talk to your group. We are experienced and ready to address school classes or civic groups of any kind. Let us know what particular area of local history that interests you. 5000 BC (?) to 1772 AD: El Sobrante Valley occupied by varied groups of Native Americans. Evidence indicates that the richness of the local environment provided for a large and relatively peaceful population. The archaeological record shows that trade was carried on with native bands to the north, especially for obsidian (to make blades and projectile points) which does not occur in the Bay Area. The presence of burial and shell mounds along San Pablo Creek indicates that this waterway was a favorite place to make semi-permanent encampments, taking advantage of the seasonal salmon runs and, of course, the presence of clean, fresh water. 1772: Spanish explorers Captain Pedro Fages and Father Juan Crespi (namesake of our local middle school) were, according to Crespi's diary, the first Europeans to make contact with the local people, later known as the Huichiun, a branch of a larger group which came to be known as the Ohlone. This proved to be a disaster for the local people, whose numbers rapidly declined. By the early 19th century, they had ceased to exist, either having died of European diseases, been killed, or absorbed into neighboring native groups. 1821: The Mexican Revolution, which began in 1810, ends 300 years of Spanish colonial rule of Mexico, including Alta California. The new government in Mexico City, in order to encourage settlement in sparsely-settled California, begins to award large grants of land to army officers and others. 1823: Francisco Castro and his wife Maria Gabriela Berryessa become the first European settlers in what was to become Contra Costa County. 1834: Formal title granted to the Castro family to Rancho San Pablo, about 18,000 acres of land, including what would become the towns of San Pablo, Richmond, and El Cerrito. 1841: Brothers Victor and Juan Jose Castro (sons of Francisco) apply for a grant of sobrante (surplus) land "lying between the Ranchos San Antonio, Pinole, Valencia, and Moraga." 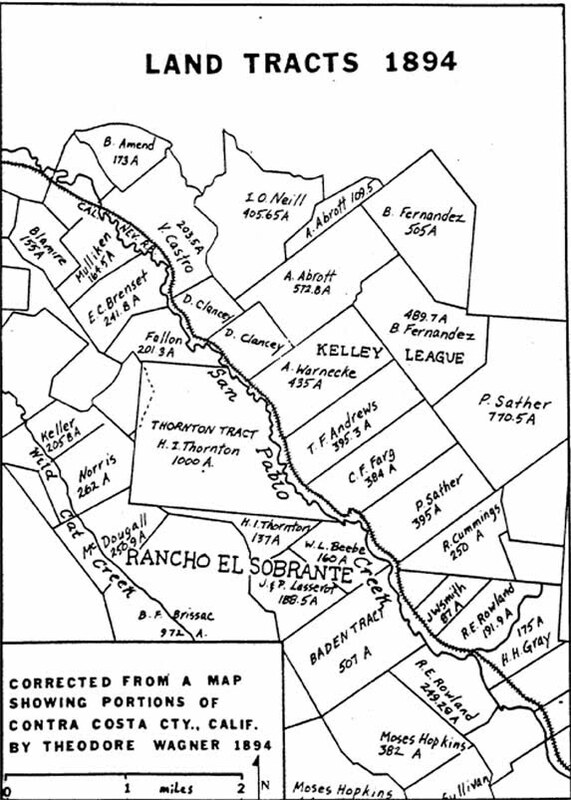 The parcel, appropriately named Rancho El Sobrante, is granted to the brothers by Governor Juan Bautista Alvarado, but the issue is complicated by the fact that the surrounding ranchos have indefinite boundaries, which leads to decades of litigation. To access a history of the El Sobrante grant, Click Here, and then click on "View the Book" and go to page 298. You will be looking at an on-line version of the history of Contra Costa County, written in 1882. 1848: The two-year war with Mexico is concluded with the signing of the Treaty of Guadalupe-Hidalgo, which, in theory, respects the boundaries of the Mexican land grants. 1848: Gold is discovered at Sutter's Mill, leading to the Gold Rush of 1849. Hordes of squatters settle on the land of the Californios, leading to more land disputes. 1850: California enters the Union as a Free State, without having gone through a territorial phase; it is also the first state ever to be admitted that does not border any other state. 1863: Mt. Pleasant School District created, at the eastern end of the El Sobrante Valley, serving the children of the ranchers along San Pablo Creek. At right is a photo of the Mt. Pleasant Schoolhouse, 1902. 1868: 25 year-old Patrico Castro, son of Victor Castro,. settles on his 100 acre ranch along Castro Creek, where he raises cattle and pigs and operates a slaughterhouse. Around him are similar ranches, settled mostly by European immigrants, with names like Abrott, Clancy, Thode, Wilkie, Clark, O'Neill, Warnecke, Fernandez and Amend. 1880: Martha Sheldon and Burkard Amend granted authority to open the first Sheldon School. 1881: The California & Nevada Railroad is incorporated, with plans to run through the El Sobrante Valley and on to Nevada. 1882: Victor Castro's claim to the Rancho El Sobrante is confirmed, but due to legal problems and costs, by 1893 only 549 acres remain of the original (about 20,000 acre) grant. 1888: The California & Nevada Railroad has laid tracks as far as Oak Grove, on the property of H.N. Thode, near the present intersection of the Dam Road and Valley View. The railroad is managing to make a little money by taking excursionists and picnickers out to the country. 1889: The train has reached Laurel Glen Resort, on property belonging to Daniel Clancy, where the current Kennedy Grove Park is located. The next year the train reaches Orinda and never goes any further. 1899: Danish immigrant Soren Skow founds the S.P. Skow & Sons Dairy, on land leased from German immigrant Auguste Warnecke. The C&N Railroad runs its last train. 1906: People's Water Company incorporated, with plans to build a reservoir on San Pablo Creek. 1916: Construction of San Pablo Dam begun; People's Water Company taken over by East Bay Water Company. 1921: Soren Skow moves his family and business to new home along Clark Road. The dairy becomes known as the Richmond Farm Creamery. 1923: East Bay Municipal Utility District created, which takes over operation of the San Pablo Reservoir. 1929: First water flows into the San Pablo Reservoir from the Mokelumne River. 1932: The fifth (and last) Sheldon School is built on the property now occupied by the Sherwood Forest Freewill Baptist Church. The old school is moved to the Skow Dairy, where it is used as a bunkhouse. 1933: Groups of young men, members of the newly-created Civilian Conservation Corps, build a camp in the present-day Kennedy Grove area and begin working around the San Pablo Reservoir, building roads, cutting and planting trees, and constructing a series of rock check-dams. 1936: For the first time, the San Pablo Reservoir is full. 1938: Ed and Teresa Banducci purchase a road house along the Dam Road, which re-opens as "Ed's Tavern." 1940: Henry Kaiser begins construction of the first of four shipyards in Richmond, heralding the beginning of a new wave of immigrants to California. It comes to be called the "Second Gold Rush." El Sobrante's population begins a period of rapid growth. 1943: John Oliver buys an existing hardware store along the Dam Road in the emerging downtown section of El Sobrante. 1944: The El Sobrante Fire Protection District is created, which effectively defines the growing community of El Sobrante. Click here to view map. 1947: Ed Galli begins publication of El Sobrante's only newspaper, the Herald, which adheres to a strict policy of reporting only local news. 1948: Earl "Flat-Top" Smith builds two new subdivisions in El Sobrante--Rancho Vista (also known as the Serpa Tract) and Canyon Park. These homes are small but very innovative, and influence the development of the high-end Eichler homes. For more information, click here. 1949: A brand-new fire station, located along Appian Way, is opened with great fanfare. The Park Theatre, El Sobrante's first and only movie theater, is opened. The very first movie shown there is "Yes Sir, That's My Baby" starring Donald O'Connor. 1955: Another big year for El Sobrante. De Anza High School is opened. Construction of new housing begins along May Road (actually in1954-see clipping), in an area which has just been annexed to Richmond. Residents begin moving into the newly completed Sherwood Forest subdivision. The first report on the feasibility of El Sobrante's incorporation is issued (Click Here to view this report). The old recreation center at La Honda Bowl closes down. 1957: El Sobrante's first full-service post office is opened, in the building now occupied by Wadsworth Glass Company. The post office had previously been located in a variety store, and before that, in a grocery store. 1961: The new El Sobrante library (see image at right) is opened at its present location at Appian Way and Garden Road. For the first time, the community has a library in a building that is dedicated to that purpose. 1967: Kennedy Grove Park, part of the East Bay Regional Park District, opens after much planning and anticipation. Senator George Miller Jr. is the keynote speaker. Click Here to read Senator Miller's speech. 1973: Finally, after years of negotiation and planning, the San Pablo Reservoir is opened to the public (but not for swimming). 1978: Richmond Elks Lodge No. 1251 moves into the old Lee's Variety Store building (which had also been home to the "Klassic Kitten"). 1985: Carriage Hills North subdivision constructed, on land formerly owned by Cutter Laboratories. 1989: Construction of Carriage Hills South subdivision begun, leading to substantial community opposition. 1994: First El Sobrante Stroll. 2000: SPAWNERS (San Pablo Watershed Neighbors Education and Restoration Society) is founded, whose mission is to protect and preserve San Pablo Creek and its tributaries, from the Dam to the Bay. Opening Day, Children's Reading Garden, July 28, 2007. From left to right: Elizabeth O'Shea (SPAWNERS), Anne Cain (Head Librarian, Contra Costa Library system), Donald Bastin (Chair, R-9 Committee), Supervisor John Gioia. Note to Researchers: The information provided in this website is made freely available as a courtesy to the public. We only ask that, when using or quoting from our documents that you cite the appropriate source--the El Sobrante Historical Society. Thanks. January 2012: The History of El Sobrante, published by Arcadia Press, the foremost publisher of local history in America, is now available! Go to the Events page for more information. As of May, 2017, the El Sobrante Historical Society was granted status as an exempt organization as described in Section 501(c)3 of the internal revenue code. EIN# 82-1977777. Your donations may be tax-deductible.